Come join us tonight (Friday, 6/22) at Fresh Cafe for Pigeon John performing live at Prototype’s Anniversary Party! We still got a few Pre-sale tickets for $20 and are available at both shops. Doors will open at 8pm. Ages 18 and over are welcome. KTUH’s Got Rice? 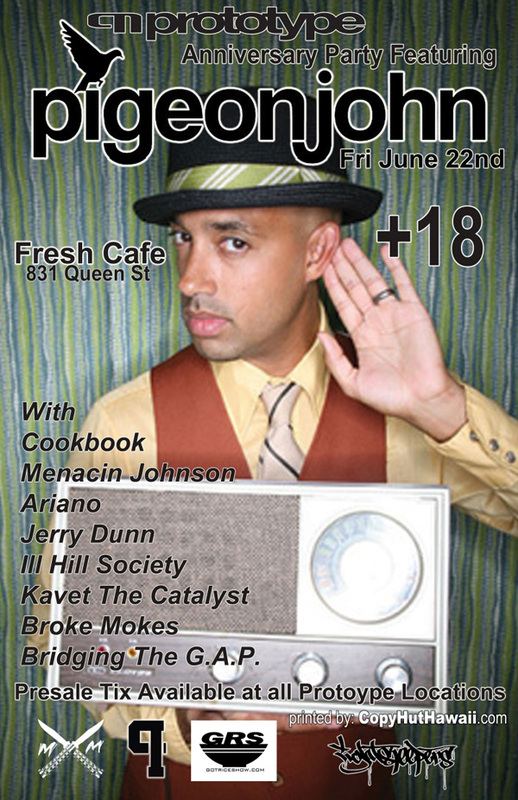 Show & Prototype presents Hip hop artist Pigeon John performing live on Friday June 22nd 2012 at Fresh Café, 831 Queen St. This will also be the Anniversary Party for local Hip hop shop Prototype. Hosted by Bone of KTUH’s Got Rice? Show, the show will also feature other mainland Hip hop acts, Cookbook of L.A. Symphony, Menacin Johnson, Ariano, John Dunn & Local Hiphop Acts Ill Hill Society, Kavet the Catalyst of the Lightsleepers, Broke Mokes & Bridging the Gap.